The Bunker Blog – News, Upcoming Events & Announcements. February at The Bunker Indoor Golf & Multi-Sport Centre means 25% discount for two players or more on any indoor golf or multi sport booking! Play golf and multi-sports n the warm and dry. All weather fun for everybody! Tuesday to Friday 12pm - 5pm take advantage of this offer and you and a friend or group can experience our state of the art golf and multi simulators. PLUS we have over 190 world famous golf courses to choose from. 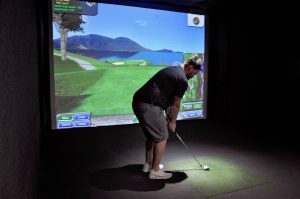 VIEW OUR INDOOR GOLF SIMULATORS HERE! If you prefer a different challenge here at The Bunker Indoor Golf & Multi-Sport Centre try interactive football and play at a world famous stadium of your choice! Take the infamous Cross Bar challenge or try Penalty Shoot Out. 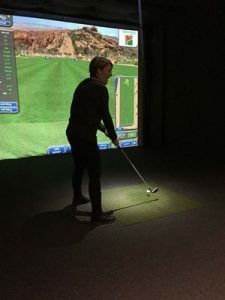 The Bunker Indoor Golf offers the ultimate in Racing Simulators. Authentic, intense and the most technically advanced racing experience you will ever find. Race at all the latest Formula One circuits from Abu Dhabi to Spa. Maybe you fancy testing your skills behind the wheel of a Ford Sierra RS500 Cosworth or a Chevrolet Corvette C7.R. 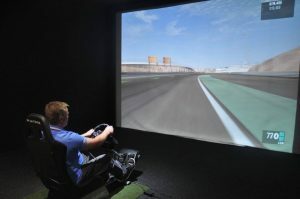 Our state of the art simulator has all the styles and forms of racing and car culture to satisfy any budding world champion. Great fun for GROUPS and families of ANY AGE! We also have Foot Golf, Foot Darts and Rugby. Choose one sport during your visit or mix and match. Call us to BOOK YOUR BAY!